Axymyia furcata McAtee (Diptera: Axymyiidae) is a xylophilic, semiaquatic fly from eastern North America. As part of a comprehensive study of the fly's distribution, life history, and phylogeography, we surveyed populations of A. furcata in the eastern United States and Canada. Collecting and rearing methods are described, and use of the niche modeling software, DIVA GIS, to locate regions with potentially suitable habitat is presented. Based on historical records and our recent survey, A. furcata is confirmed to occur from southern Ontario and Quebec, across the northern tier of states from Minnesota to Maine, and south along the Appalachian Mountains to Georgia and South Carolina. Our survey resulted in several new state records and demonstrated that A. furcata, a fly once considered quite rare, can be abundant (> 200 individuals in a single log) in suitable habitats. Larvae and pupae are most abundant in wet and partially submerged logs in small streams and seeps. Axymyia furcata has four larval instars, overwinters as larvae, and has adults that emerge primarily in March and April in the southern Appalachians and somewhat later (e.g., to late May) in the northern Appalachians, upper Midwest, and southern Canada. This article is published as Wihlm, Matthew W., and Gregory W. Courtney. 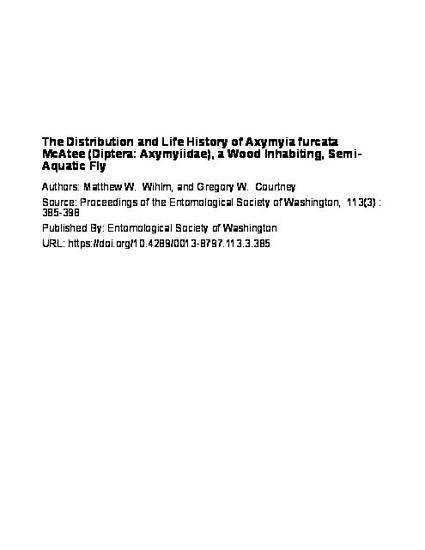 "The distribution and life history of Axymyia furcata McAtee (Diptera: Axymyiidae), a wood inhabiting, semi-aquatic fly." Proceedings of the Entomological Society of Washington 113, no. 3 (2011): 385-399.. doi: 10.4289/0013-8797.113.3.385. Posted with permission.